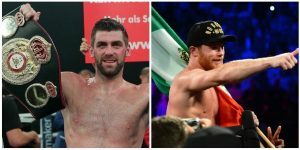 WBA Super Middleweight Regular champion, Rocky Fielding, will make his first defence of the title on December 15th at Madison Square Garden, New York, against WBC, WBA Super and Ring middleweight champion Canelo Alvarez. In a match up that has come as a bit of a surprise, Canelo moves up a weight division to try and add another title. Fielding won the title when he defeated Tyron Zeyge by 5th round TKO in July and lands a massive pay day for his first defence. Fielding is currently 27-1 with his only defeat against current WBA Super Middleweight Super champion Callum Smith back in 2015. Canelo, who added the WBC Middleweight title last month after another epic fight with Gennady Golovkin will be looking to add to his legacy. Canelo took to social media to post, “With great emotion I announce my next fight. Rocky Fielding posted that he was living the dream, from Salford Sports Centre to Madison Square Gardens. Fielding’s promoter Eddie Hearn took to Twitter to congratulate him on landing the massive fight. As yet, which TV network the fight will be on in the U.S has yet to be announced. Canelo’s fights had been a staple of HBO PPV however HBO have decided to pull out of boxing coverage. Eddie Hearn’s Matchroom promotions have a deal with DAZN who would love to have Canelo appear on their streaming service. No such problems for fans in the UK who will be served by Sky Sports Box Office.